You can be both Tweedledee and Tweedledum with this Adult Tweedle Dee / Dum Costume. 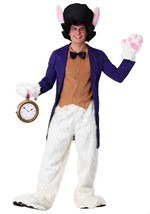 The Alice in Wonderland costume is both fun and vibrant. The round jumpsuit features an orange bottom and a yellow top. A long zipper in the back as well as an attached white bib collar with tie is also included. Plus, a plastic hoop inserts through the waist, creating a bloated look. This Adult Tweedle Dee / Dum Costume will be causing riots of laughter all night long.